Note: As on mid May Auctioneer isn’t working with the 4.1 patch for me. Your mileage may differ. There’s also a new addon which does a lot of that work for you. It’s Tycoon, and you can check it out, here. 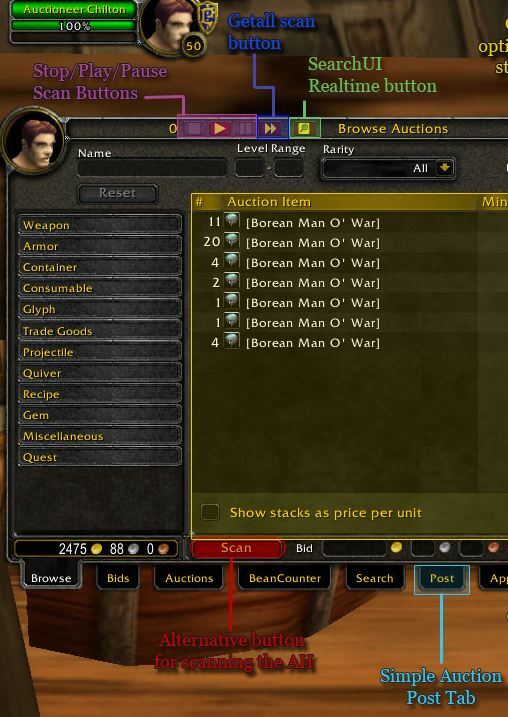 Auctioneer isn’t the only Auction Assistant addon out there, but it’s the one we use. If you want to get the most out of it you’ll find it has a bit of a learning curve and it takes some practice. It’s also free, though they do ask for an optional donation. It’s great for finding bargains, posting your stuff, keeping track of stuff, undercutting the other guy’s prices, and so on. The stuff on this page is just an overview of Auctioneer (a full guide would be 40+ pages!) You can check the auctioneer site for full docs. Here’s an old pic of one of my bank alts. Not a bad gold stash for a level 1. Auctioneer makes this sort of thing much easier than it would be otherwise. The stuff in the bag is a mix of “shopping basket” items and loot from characters. Shopping basket items are the items that I keep an eye on, so that I can buy when they’re cheap and resell when the price is right. Grab a few items that you want to keep track of, or just your herbs, ores, primals, etc., and make your own basket. It helps to have four Frostweave (20 slot) bags for this stuff. If you’re all herbs then get the bigger herb bags, and so on. Go through your basket, shift+click each item and the name will pop into the search field. Hit the search button and you can see what’s available. Appraiser does the same thing as browse/search, but better. On the left side is the list of everythng in your bags (and you can hide items.) The number to the right of the item name is how many of that item you have, the number below is how many are on the AH. (you have to click the “refresh” bgutton to get accurate numbers. ) The color of those numbers tells you how many items are in each price group, according to Auctioneer’s data (from your many scans.) the price order is: low/medium/high/very high. Blue is the low priced stuff and red is the high.Some of the items shown in my bag are limited items from various vendors. The top center area lets you set stack sizes, number of stacks, time of the auction, and prices. I have it set to list prices per item, not per stack. The window to the right tells you total prices for your stack and total deposit. My routine is to go through each item in my bags, refresh the listing, and post my stuff if the price is right. If the price is too low, and if I don’t already have to much of that item, then I’ll buy out the low priced stuff. By the way, you can scan the AH from the browse tab. When that’s done you won’t have to refresh each time. It just take a while to scan, but you should be doing it anyway to build up your item/pricing data. Some people do try to game the system, by posting stuff at extremely high prices. Fel Lotus for 5,000 gold per piece, anyone? For this reason you should use your own common sense when examning price data. If something looks odd then it might well be just that. A configure button at the top lets you configure a ton of options, search parameters, display parameters, etc. The scan button, at the bottom, runs a scan of the entire AH. Pricing data is stored and you can use that data later. You should probably scan the AH once a day for at least a week to start getting decent data. Once you have some good data you can use the search tab (see below) to look for bargains. At some point, if you work at this and develop a basket of items to look for, you will have a feel for pricing and probably won’t use search much. There are a lot of options here for all kinds of searching. Read the Docs to get a feel for how it all works. You will have to do some experimenting and playing with numbers to make the program work exactly the way you want it to. In this particular case, I would be looking for items to buy and resell. The profit for any given item wouild have to be at least 3.5gold and the maximum price woiuld be 400 gold. This means that your search won’t show the high-end epic items (those selling for 5k, for example) and it wont show stuff that might sell well, but which won’t make enough gold. There are some filters you can set so that only certain groups of goods, such as “glyphs only,” will be scanned. So there’s really a lot of stuff in this little addon. You can do all kinds of research and get as simple or as complicated with your buying and selling as you like. One idea is to have a stash of the stuff in your personal guild bank (you do have a personal guild bank for your banker, don’t you?) that you are storing for the right time. Auctioneer has an option to put pricing data in the item tooltips. Play with that until the info you want is in the display. According to this the market price for Shimmering Ink is 7g 66s, the 48 hour deposit is 48s, and there are only 4 matches (all overpriced) on the market. You know they’re overpriced since the 4 is in red. So if you had a stash of the stuff then now would be a great time to post your stash. So you run an AH scan and then look through your stashed items for stuff that has very little supply at the moment. You then post your items for a good price. I just discovered this amazing gold addon that automates the most powerful gold making strategies in the game. It’s called Tycoon and it may be the most powerful gold making product ever. PDF guides don’t even come close. If that item, for example, is something that should be gathered with mining it will give you an optimized mining route that leads you over the most densely populated mining nodes in a zone… resulting in over 2-3 times more ore than normal. It does this for all the major strategies in the game, like Gathering, Grinding, and Crafting. It even knows if there is too much competition and tells you to go for a different item instead. Basically it takes a number of the chores involved in making gold and makes them easier.